If you are looking for information on the PRstore franchise business opportunity, PRstore franchises or PRstore franchising, then you have come to the right place. 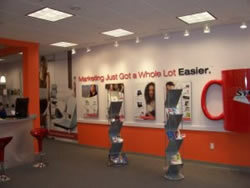 A new retail concept, PRstore is rapidly becoming America's marketing superstore. PRstore was created to provide marketing tools, promotional products and expert advice to small businesses, non-profits, civic groups, faith-based organizations and individuals who do not traditionally utilize full-service ad agencies and public relations firms. PRstore's emphasis is on convenience, ease of access, affordability, and the availability of marketing products purchased by customers who know what they need or who can be guided by PRstore's professional sales staff. At PRstore, our products and services are extensive and designed to meet all of the most common marketing needs from logos, brochures, direct mail and press releases to cutting edge e-commerce web sites. 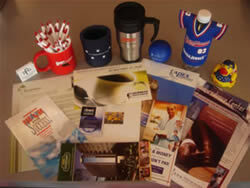 PRstore also has one the largest displays of specialty advertising logo items available anywhere. PRstore is a franchise company - a business system that provides its members with a system of tools, processes and proprietary knowledge. 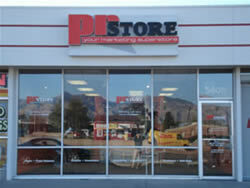 While marketing is an integral function in all types of franchises from fast food to quick oil changes, PRstore is one of the few franchise concepts designed to take full advantage of a marketing professional's core strengths and experience while providing an opportunity to own and operate their own business. All creative work is performed for your store by PRstore's DesignCentral staffed by writers, editors, designers, producers and marketing specialists. "The PRstore was just what I was looking for. They created my logo and even helped me get it trademarked. I am proud to be the PRstore's first customer anywhere. But I know I won't be the last." "When we needed golf umbrellas with our logo for our statewide meeting, the PRstore came through with the most competitive price and great service. They were a pleasure to work with"